Located in the upscale community of Paso Ancho. It wouldn't be an understatement to say this could easily be a film stars ideal retreat. It has a wonderful year round climate and more peace, tranquility and serenity than you can imagine. This has acreage plus-which extends right to the river bank. As this overview picture shows the house is set in a large garden. There is a covered car port on the side and a large open patio on the river side. This patio is where you might spend the majority of your time. Most people eat breakfast, lunch and dinner here and then might enjoy a glass on wine and gaze up at the stars as the day draws to a close. There is absolutely no light pollution here so you view westward to the setting sun and the evening stars will be truly breathtaking. Across the fence is the Chiriquí Viejo river. Thanks to a 1923 American Ambassador, the river is trout bearing. Fresh fish for breakfast? As you enter though the front door turning left is the living/dining room. There are three bedrooms, with 2 bathrooms. as you can see the rooms are expensively tiled and spacious. Extensive use is made of local hardwoods in the closet doors and bathroom vanities. The master bathroom features a tub and a shower. Hot water is available throughout the house. For comfort during the cooler evenings there is a gas heater available in the sitting room. This is a view across the living room to the front door. The bedroom doors on the left and the glass patio doors are on the left. Another view across the room toward the kitchen showing the dining table. The kitchen come complete with a microwave, toaster oven and a large stove. AS A BONUS, the home is offered as turn-key. Which means that all you need to bring is your suitcase with your personal belongings. Knives, forks spoons, bed linen, towels, plates etc. will all be there waiting for you. This is the utility room with and over-and-above washer dryer. You can see the gas water heater on the right corner wall. If you stand up on the patio you can see the rushing waters of the river. These sounds are a wonderful way to lull you into a deep and pleasant night's sleep. Bird-watching enthusiasts will be in their element as many brightly coloured creatures including some almost iridescent species of hummingbirds will there for their delight”. Your garden is surrounded by tall pines trees. Flowers of all varieties grow year round. Don't worry about mowing the grass- there is always affordable local gardeners who will do the job for you. These are actual flowers filmed in the garden in July of this year. Normally July would be in the rainy season but this year -maybe due to El Nino - there is an unseasonal belt of fine sunny weather. Even so, most days in this region start off sunny and you can see blue skies and white fluffy clouds. Then around mid-day or later you get rain. The dry season from December to May is almost rain free. Serenity and solitude; this is the roadway leading to the house. The main gate to the public road is about 100 yards behind you. This is Panama's highest peak; the 11,400 foot Baru Volcano. In the dry season it is possible for fit people to hike to the summit, where you can see both the Pacific and the Caribbean oceans. This I promise is one feature you will never tire of seeing - it never appears the same from day to the next. As you can see from this map the property is located approx. 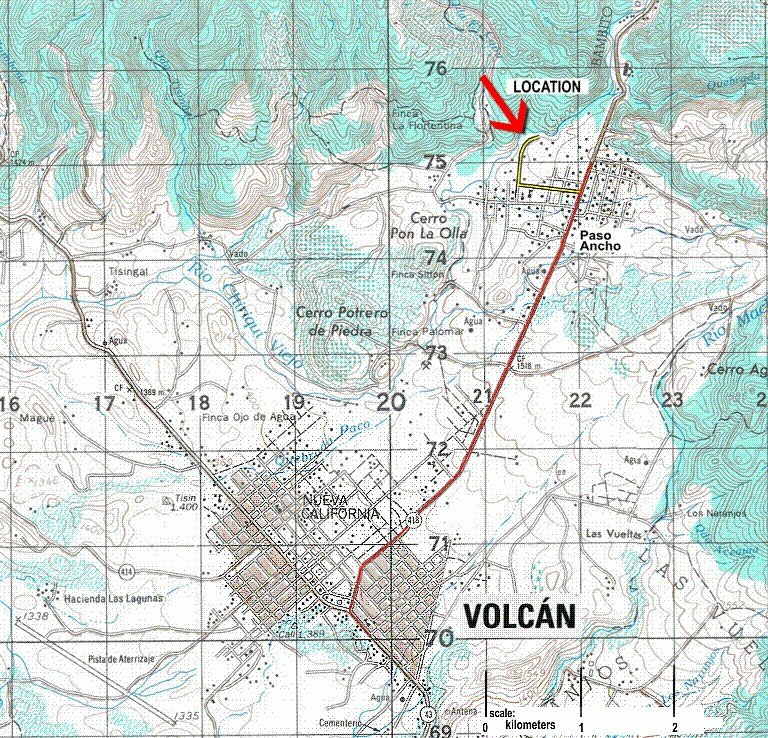 5 kilometers from the center of Volcan, and about 1/2 kilometer from the paved road. There is a YouTube video of this home. Construction year 2007 and based on high North American standards. This home is offered for sale with clear title. In July 2015, the new CABALLO LOCO (mad Horse) saloon opened. There is music every weekend and here you can meet all your expat friends.